A Manchester packing and storage box testimonial: "Hi Tony, Thank you very much for the prompt and informative service that you provided yesterday. I looked at six box suppliers on the internet before selecting your company. I was impressed with the straight forward descriptions on your website and the fact that you provided same day delivery really impressed me. The Starter Moving pack was just what I needed and the quality of your materials is far better than those provided by other companies I have used in the past. I will definitely use your services again and I will recommend you to my friends"
We supply packing and storage boxes, wardrobe boxes, glass and china packing boxes, discounted home moving packs, bubble wrap, tape, mattress bags, sofa covers, tissue paper, corrugated paper, stretch wrap, removal blankets and polystyrene chips throughout the Manchester Area. All our packaging materials are trade standard, just like those used by the UK’s major removal and shipping companies. All our packing boxes are strong double wall and all are printed with handle with great care and fragile messages. Every standard packing box we supply shows the ‘H’ taping method printed on one base flap. 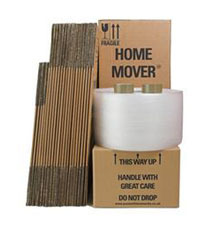 ‘H’ taping, is a box sealing method used by export packers and professional movers. With every twelve boxes, our customers are given a free roll of high quality strong bond tape. This is not done as an enticement but as a means of ensuring that our customers achieve a first class tamper evident seal on all their boxes top and bottom. On one top flap of every regular packing box we print packing and handling guidance. We also give every customer very important information regarding the surprising limitations of some packaging materials. This information can also be found contained in the pages of this website. Our combination of value, quality and service is unsurpassed for the following reasons. Because our products are bulky and large they cost a great deal to ship over distance. We therefore supply only within our own locality. This decision is helping us to deliver exceptional value to local home movers. We do not compromise on quality. All our packing boxes are manufactured from seventy five per cent recycled papers however; we always incorporate a strong moisture resistant kraft paper on the outside. This ensures that the box maintains its strength and durability for much longer. The majority of our products are delivered the same day in Manchester at a time agreed with the customer. To ensure such arrangements can be made all orders must be placed over the phone. – Call today and order professional movers packaging materials. We have never knowingly had a dissatisfied customer. However, if you are not completely satisfied with the packing containers , we offer a money back guarantee. Please see our terms and conditions.